A good friend whose brother, a lifelong Arsenal supporter, recently passed away kindly asked if I would give his late brother’s mementoes a good home. I was happy to do so, and among a plethora of Arsenal memorabilia there were a number of items that I found of great interest. 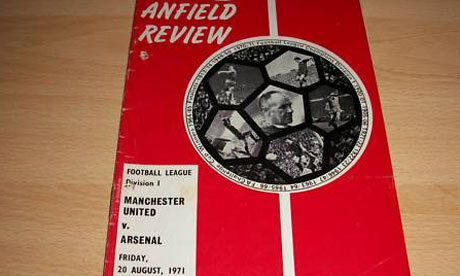 Among the vast collection of programmes, many of which are for key games, there is a programme of a league game, held at Anfield, between Manchester United and Arsenal; a game held in Liverpool as Old Trafford was undergoing a 'knife based' crisis. Programmes for games at Highbury between Arsenal and Real Madrid, a Brazil XI and Glasgow Rangers. There are records too, 7” vinyl including The Morning after the night before by John Devine; a curious little ditty and a variety of Arsenal squad songs. A Super 8 film of the Arsenal v Manchester united ‘seven minute Final’. A number of FA and League Cup Final programmes along with the Final programme for the ECWC final v Valencia at Heysel. Several Signed team photos, and most interesting a headed letter signed by the Arsenal team circa George Allinson and The Arsenal Stadium mystery. A treasure trove indeed and I am in no doubt that the previous owner, who travelled near and far supporting the Arsenal, can see that it is in good hands.